TAIAOS is a unique, rare digital artwork that is always on sale. It can bought at any time by anyone, because the owner must always specify a price they are willing to sell it at. Through this always-on auction, it supports the artist by requiring the owner to pay a 5% pa patronage towards the artist at their self-specified price. If the owner does not pay required patronage, it can be foreclosed by a digital steward for safekeeping. The scarcity of the digital artwork, its always-on auction & management of patronage towards the artist is all enabled through blockchain smart contracts on Ethereum. In order to buy this rare, digital artwork, you have to have Ether cryptocurrency and an Ethereum-enabled browser. Once bought, it is a collectible and viewable in any supported browser. Today, I’m launching the first version of this art project. Improvements are on its way. To buy it, you have to specify your own price in ETH, along with a deposit for patronage. A disclaimer: The smart contracts have NOT been audited, so only participate if you understand the risk involved. Does this digital art property rights system change the relationship between collector/patron and artist? Does allowing for a more readily available avenue for patronage create more revenue for an artist? Does this property rights system allow for more sustainable funding of creative works? Does an always-on auction and market for arts and subsequent speculation/pricing change the relationship towards the art and the artist? Does the increased turnover of the digital art and subsequent possibility of ownership by more people increase the value of the art (financially and artistically)? 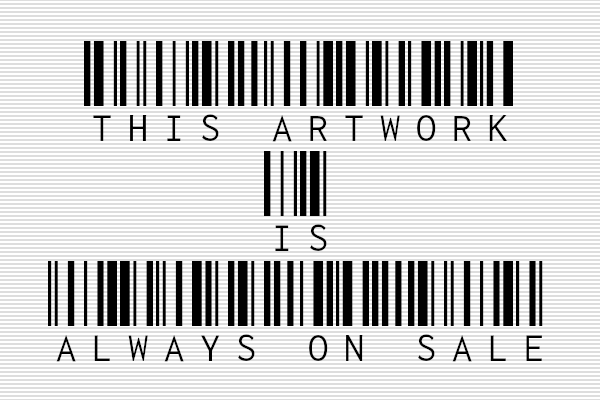 Does always-on-sale art help us understand how much of our current online life is already always on sale without us knowing it? This art project is based off of a modified Harberger Tax (or Common Ownership Self-assessed Tax (COST), promoted in Radical Markets by authors Eric Posner & Glen Weyl. The tax (or in this case, patronage), goes directly to the artist. Radical Markets puts forth exploratory ideas with regards to more effective allocation of property ownership. Especially, it aims to reduce the unproductive loss of capital that occurs in monopolies. Thus, Harberger Tax is especially meaningful for capital that ought te be owned in the commons. In this case, Harberger Tax is used to put forth a new form of patronage for the arts along with a novel pricing scheme. The desired goal is to ensure that the artist earns into perpetuity for the art they created, as well as making sure that whomever owns the digital artwork doesn’t keep it forever. More collectors at more fair valuations means more people can participate in digital art ownership & collecting. There are many ways to repurpose Harberger Tax in the domains of the arts & intellectual property. For example, a true COST would have artists co-create an art piece and have its generated value be shared. I have written before on what Harberger Tax is and how it can be utilized in the blockchains industry and the arts. What is Harberger Tax & Where Does The Blockchain Fit In? For technical details, please visit the Github where you can fork the project to create your own artwork that is always on sale. Besides tightening up the user experience (biggest short-term priority), the github repo also contains additional future proposed improvements, including DAI support & experimenting with other technical possibilities like meta transactions. Explorer of all stories, master of sunsets. Writer, Coder, Musician & Dancer.